Home » Service Manual Catalog » EPSON Service Manuals » InkJet Printers » SM_WF7110 I have paid for Reset Key but not received yet. WF-7110 Series, WF-7610 Series, WF-7620 printers Service Manual New! 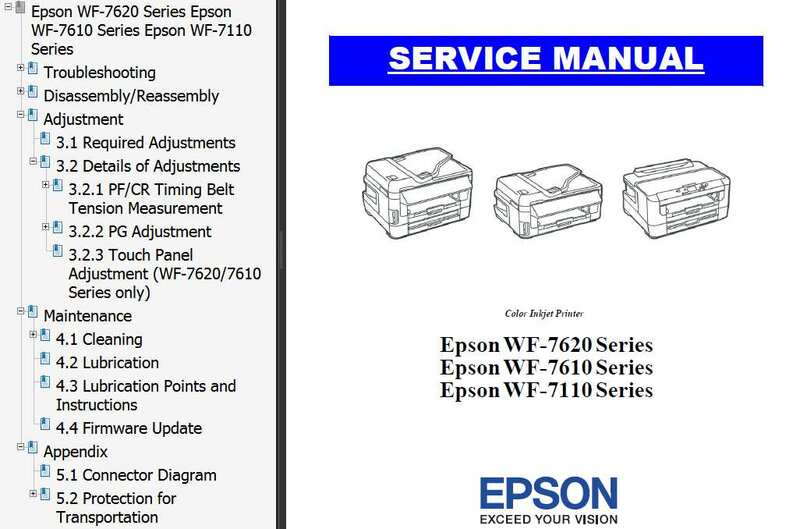 This Epson WF-7110 Series, WF-7610 Series, WF-7620 Series Service Manual describes basic functions, theory of electrical and mechanical operations, maintenance and repair procedures of the printer. This printer models Epson WF-7110, WF-7111, WF-7610, WF-7611, WF-7620, WF-7621 are NOT supported by WIC reset utility and its waste ink pads counter CAN'T be reset by WIC Reset Utility. This models have separate maintenance waste ink cartridge with its own IC Chip. So, if waste ink counters overflow - customer has to replace Maintenance Cartridge by new one. thank you so much 2manuals for the reset key and assistance, i'm a baby boomer but i found it easy to do and am so glad i saved a printer, first time i have ever done this and hey i did it, thanks heaps. Epson PX830. A printer error has occurred. turn off the printer, then press On button to turn on. see your documentation. Can I reset this printer? This program is a definate must have if you want to service your own printer. Using this program along with the servive manual (440,640,740) will help you to determine what the problem is. The program shows print head voltages, waste ink counter and reset, and recover print head functions just to name a few of the useful functions that this program has to offer. It returned my printer from a paperweight into a working Epson 640 in minutes. Even if your printer is working properly you can use this program ensure it will keep working. For less than $6.00 it is worth having. Notify me of updates to WF-7110 Series, WF-7610 Series, WF-7620 printers Service Manual New!